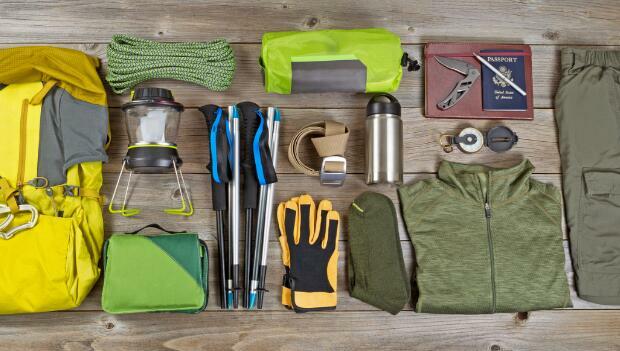 Wondering what to bring on a hike? Here is a list of the top ten things you should keep in your backpack on any day hike. Obviously, you will need to make changes to your overall list based on weather conditions, season, terrain and length of trip, but generally speaking, these items will cover your basic needs. Take a map and/or guide book with you. National Geographic's Trails Illustrated Maps are excellent. Use the map to keep track of your progress so that you know where you're at all times. It's also a good idea to carry a compass, and know how to use it. Take plenty of water with you, especially in the summer. You can sweat anywhere from 1/2 to 1 quart of fluid for every hour you walk in the heat. This fluid/electrolyte loss can exceed 3 quarts per hour if you hike uphill in direct sunlight and during the hottest time of the day. If you plan on drinking water from the backcountry, know that it must be treated for Giardia lamblia. Giardia is a parasite that can cause an intestinal infection with a variety of symptoms. To avoid this infection, boil water for at least one minute or use a filter capable of removing particles as small as 1 micron. Liquids such as water or sports drinks are best for you. Drinking soda or alcohol while hiking will dehydrate you. Make sure to pack extra liquids with you in case your hike takes longer than expected. The best snacks for the trail are ones that will provide you with high energy, such as fruit, granola, peanut butter, bagels, power bars, fruit bars, G.O.R.P. (trail mix), beef jerky, or even candy. Again, take extra food with you in case your hike takes longer than expected for whatever reason. Throw a couple of energy bars in your pack. They're light weight, and will pack a nice punch if needed. Learn first aid and carry a first aid kit in your pack. Know what to do in case of an emergency. First aid training will teach you how to react and deal with specific types of injuries. No, you don't need to tote a tent around with you all day, but do keep rain gear in your pack in case the skies open up while you're out on the trail. Weather can be very unpredictable in the mountains. Nothing is worse than getting soaked miles from the trailhead, which can lead to hypothermia. Even during the summer, a wet hiker can succumb to hypothermia at higher elevations.